The main keynote of the event will be on “German direct investments in India: Motives, regional distribution and effects” by Dr. Madan M. Arora. Dr. Arora is an entrepreneur and has served as co-head of GIRT Hannover. He has recently completed a Ph.D. dissertation on German FDI in India at the School of Economics and Management of Leibnitz University Hannover. In his study, Dr. Arora takes stock of German FDI in India and investigates the motives, design, choice of location, and the effects of investment decisions. His talk would be in German, followed with a discussion in English. In a second presentation, Dr. Rajnish Tiwari will briefly present the results of a study of Indian FDI in Germany. This study is based on the Reserve Bank of India’s data on outward FDI between July 2007 and May 2018. This comprehensive study reveals the patterns of Indian investments in Germany. Our events are generally bi-lingual to allow interaction with all interested persons without language barriers. The meeting will provide an excellent opportunity for “networking” with snacks and finger food. Participation in the event is free of charge, but requires a prior binding registration. Kindly register latest by Wednesday, Sept. 5, 2018 by e-mail to tiwari@tuhh.de. Due to limited availability of seats the accepted registrations will be confirmed. Right to admission is reserved. Looking forward to an interesting and informative get together! The figures include investments in India by German holding companies based in third countries. 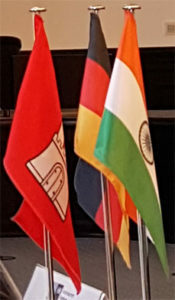 Dieser Eintrag wurde veröffentlicht in English, Events und verschlagwortet mit Event Registration, FDI, Germany, GIRT, GIRT Event, GIRT Hamburg, Globalization, Hamburg, Indian FDI in Germany, Indian Overseas Investments, Indo-Hamburg Relations, TUHH von tiwari. Permanenter Link zum Eintrag.